This time of year it’s hard not to take advantage of all of the fresh produce available at such low prices. One item that I get very excited about is peaches. They are in season for such a short amount of time and they might as well be a completely different fruit than out of season peaches because their flavor doesn’t even compare. I bought a bunch of peaches this morning, some of which I used to make a peach crisp. I ended up topping my crisp with some vanilla yogurt because I couldn’t deal with the guilt of putting ice cream on top of my buttery, streusel topped desert. I’m trying to be good… I’m trying. I threw in some almonds and almond extract just for fun but if you don’t like almond, simply skip the extract and slivered almonds and you’ll have yourself a classic peach crisp. You can also experiment with adding raspberries or blueberries… tart fruit mixes really well with the super sweet peaches. Pictured here with vanilla yogurt. 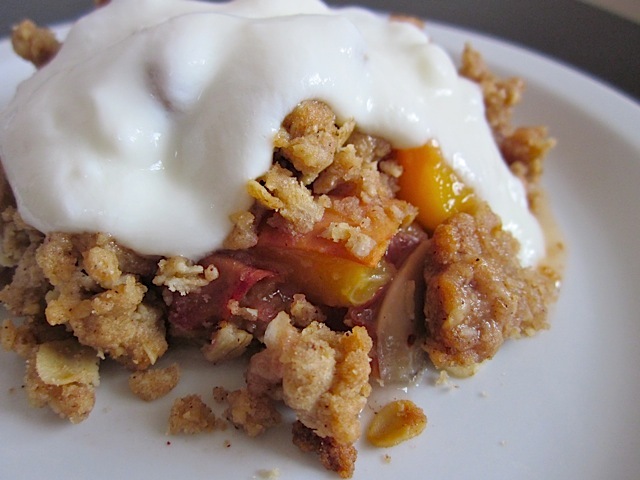 Use the fresh summer peaches to make this quick and easy dessert - Peach Almond Crisp. Wash the peaches, remove the pit and dice into one inch pieces. 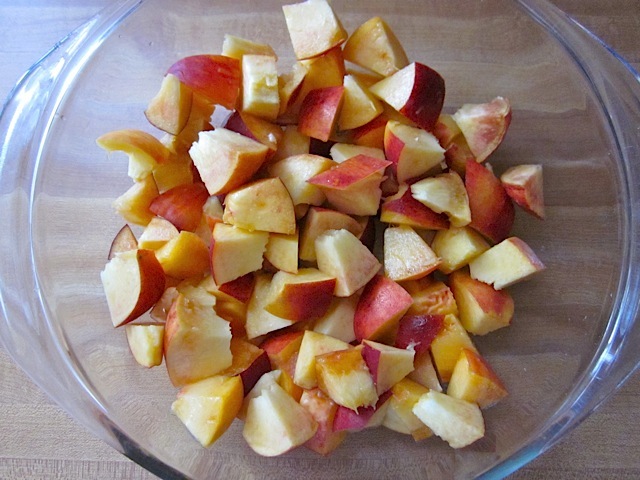 Place the peach chunks in the bottom of a glass casserole dish (8×8 inch works well, a glass pie dish will also work). Preheat the oven to 375 degrees. 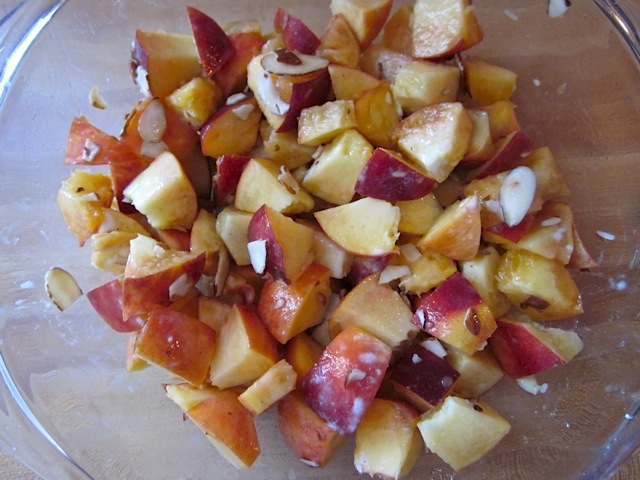 Sprinkle the lemon juice, corn starch, almond extract and sliced almonds over the peach chunks. Stir the mixture until the peaches are well coated. 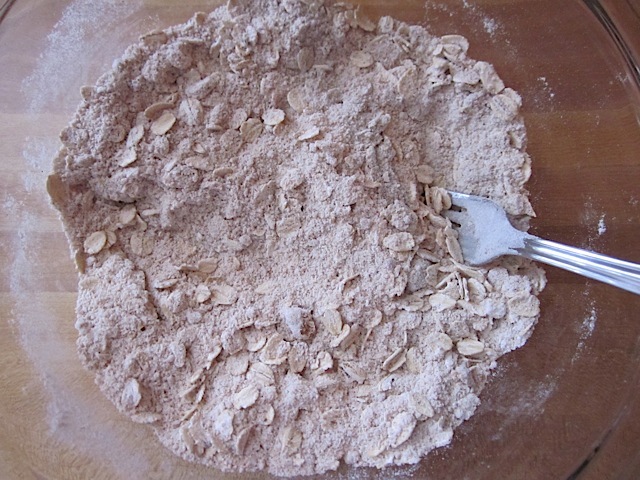 In a separate bowl, combine the flour, oats, brown sugar, cinnamon and salt. 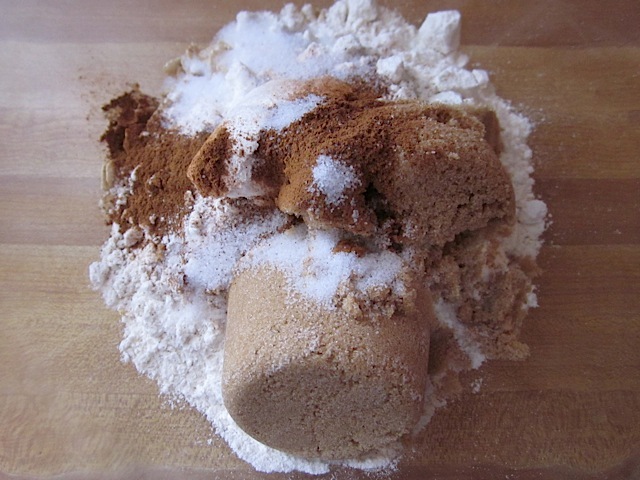 Stir until they are well mixed and no chunks of brown sugar remain. Mix the room temperature butter into the mixed dry ingredients until it is evenly incorporated. Your hands will work best for this job. I simply “squish” the butter into the dry ingredients over and over and over until it is all mixed. 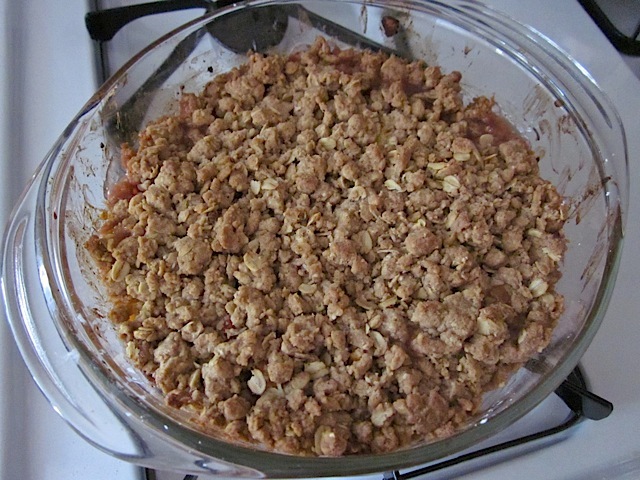 Pour the buttery crumble topping over the peach mixture and bake it in the preheated oven (375 degrees) for 45 minutes. Let cool slightly before serving! 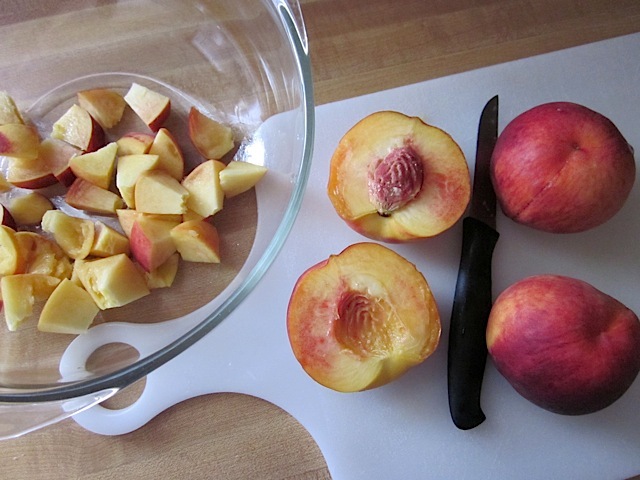 Wash the peaches well then cut into one inch chunks (remove the pits, of course). You need enough peaches to cover the bottom of your dish in at least two layers of peach chunks. Mix the corn starch, lemon juice, almond extract and sliced almonds into the peaches. Measure all of the dry ingredients into a separate bowl. 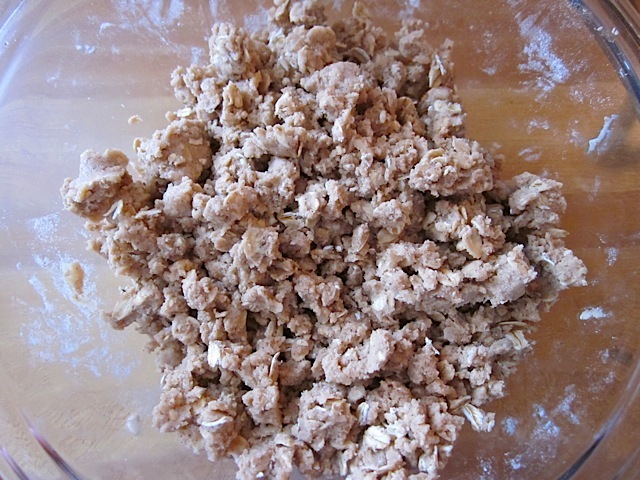 Mix the dry ingredients well before adding the butter so that it will be an even mixture. Squish the room temperature butter into the dry mixture until it is evenly incorporated. 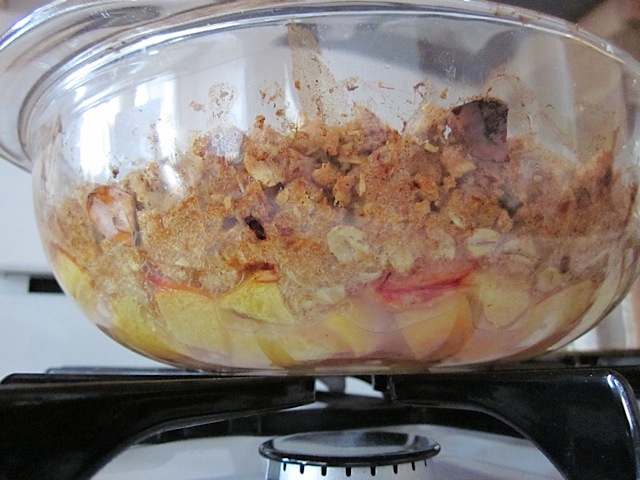 Pour the streusel topping over the peach mixture and bake at 375 degrees for 45 minutes. Try not to die from the heavenly smells coming out of the oven. It will look like this when it is done baking; bubbly underneath, crisp on top! Here is a side view so you can see the yummy, juicy peach mixture underneath. The peaches release a lot of juices but the corn starch will help it thicken so you don’t have a soupy mess on your hands. Can you make the peach almond crisp (7/10/10 recipe) with frozen peaches? If so, how much and any special requirements? I love love love your blog and have tried many of the recipes. Thanks so much. I’m sure you could. :) I’d try using about three cups of peaches. Let them thaw, then cut them into slightly smaller chunks. In addition to the cornstarch, I’d try adding a tablespoon or so of flour to help soak up the extra juiciness from the frozen peaches. Lindsay – Yes, you can mix the topping together and keep it in the refrigerator (sealed air-tight so that it doesn’t absorb moisture). Don’t put it on the fruit until just before you bake it. If it gets soggy, it won’t bake to the right texture. Do you think it would be possible to make the topping ahead of time? Made it again today! Yum! Next time I’ll save a few almond slices to sprinkle on top though. Just bought peaches & blueberries @ the farmer’s market, this is going to be goooooddd. OMG! this looks sooo good….can’t wait to try it.